Despite Asia-Pacific’s unrestrained use of coal — and its contribution to greenhouse gas emissions — a new WWF report finds there is a role for the fossil fuel in a carbon-constrained energy future. Sydney, Australia – Despite Asia-Pacific’s unrestrained use of coal — and its contribution to greenhouse gas emissions — a new WWF report finds there is a role for the fossil fuel in a carbon-constrained energy future. To do this will require new forms of technology transfer. Based on independent analyses commissioned by WWF from energy experts across the region, the report finds that the market value of coal does not reflect its toll on human health and the local and global environment. If these factors were taken into account alternative energy technologies including low-emission coal technologies would be more economic. “The Asia-Pacific’s coal use is not just a climate change issue but is also a community and local environmental issue," said Ina Pozon, WWF International’s Asia-Pacific Coal Initiative Coordinator and author of the report. "Coal currently plays a dominant role in developing countries, such as China and India, and it is unrealistic to expect an immediate shift away from coal." The report, she adds, provides parameters that define responsible coal use that allow developing countries to continue using this fuel to achieve economic growth, while minimizing its impact on people and the planet, particularly when it comes to global warming. According to the WWF report, coal has a role to play in meeting the Asia-Pacific region’s energy demands, but that it must be reduced to no more than 20% of all energy produced. 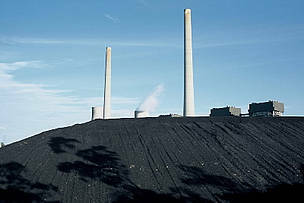 Coal energy plant. Hunter Valley, New South Wales, Australia. Are the costs of using coal higher than the cost of cleaning it up?